Best-Hoster Review 2019: Is Best-Hoster a Good Hosting? Russian hosting provider Best-Hoster sells affordable hosting packages. You won’t get a plethora of premium features, but you will get hosted on rock-solid infrastructure. Russian company Best-Hoster (sometimes without the dash, and sometimes with the .ru extension) has been providing website hosting since 2006. The company owns its own Tier III data center and has more than 10,000 customers. Its website is available in Russian. It’s nice to see a host that owns and operates its own data center because it means the company can respond quickly to technical issues. It’s also nice that this is a Tier III data center because it means there should be less than 1.6 hours of downtime per year. Best-Hoster doesn’t offer an uptime guarantee, but it links to the third-party Ping-Admin.ru testing tool that indicates an average uptime of 99.77%. Web hosting beginners will be pleased to see a one-click script installer and a website building tool included in all shared hosting plans, although it would nice to see a bit more information about these tools on the website. Web hosting experts will like the support for various versions of PHP, along with Perl and cURL, but sadly no Ruby or Python. You also get Cron jobs and SSH access. The prices are affordable, and there’s certainly a package to suit most budgets. You can purchase hosting on one-month to three-year terms, and you get a deep discount if you sign up for longer than a year. You always have to pay extra for SSL certificates. 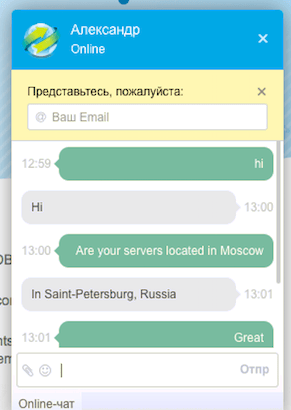 New customers get a free .ru or .rf domain, which might not be much use to non-Russian customers who might also struggle on this vendor’s checkout page because it doesn’t translate into English very well. There is an FAQ page to help you help yourself, but it’s not particularly pretty. Best-Hoster is one of the smaller Russian hosting providers, with only 23 servers in operation. You won’t get some of the features you’d expect from a larger brand (such as 24/7 customer support, advanced coding languages, and an uptime SLA) but you will get some beginner-friendly tools and instantaneous responses from customer service. Wondering how Best-Hoster stacks up against other Web Hosting companies? Enter any other Web Hosting company and we will give you a side-by-side comparison.